The EURUSD staged an impressive rally over the course of the last two weeks. This comes as the pair is basically stuck in a trading range between 1.0800 – 1.0875 resistance and support down near 1.0520 area. Price is now approaching that key resistance up near 1.0800 – 1.0875 area, and we will watch that area closely for price action sell signals. However, if price were to close above 1.0875, we would no longer be looking to sell at that point. Also, more aggressive traders may consider looking to buy on a pull-back near 1.0620, in-line with the current bullish surge. The GBPUSD rallied higher last week after the interest rate hike in the US. Price had been selling-off prior to the rate hike, declining within a range between 1.2700 and 1.2000. Price is currently trading at key 1.2350 – 1.2400 resistance area and it will have to close above that area to really have a chance at any further significant gains. As of now, this pair is looking semi-bullish (strong) but due to the resistance band coming in close overhead, we wouldn’t be looking to buy here. Traders could potentially look to get long / buy this week on mild rotation lower, following by a strong price action buy signal. 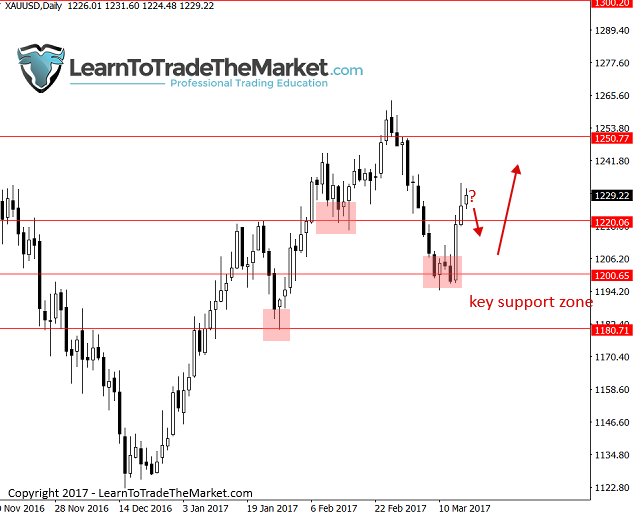 Gold found support last week down near $1200.00 after a sell-off the previous two weeks. The trend is currently up in Gold and we have been talking about looking to buy it on a pull back in our recent members area commentaries. Our strategy of choice for this week remains the same; looking for a temporary pull back lower, perhaps to $1220.00 – $1200.00 followed by a price action confirmation signal to be a buyer and rejoin the uptrend. Crude Oil firmed up last week following the large sell-off that took place two weeks ago. We recently have flipped to bearish (sellers) on this market and we retain that bias this week. You will notice key resistance up at the old support, near 50.70 – 51.20 and that is the ideal sell area for this week; look for price action selling opportunities near that resistance zone this week.